We would love to post your creations here. We are happy to share your name (or not) and offer a link to any site you may have- commercial or personal is fine. This page is all about sharing! Hello! I am mixed media artist residing in the Bay Area of CA. 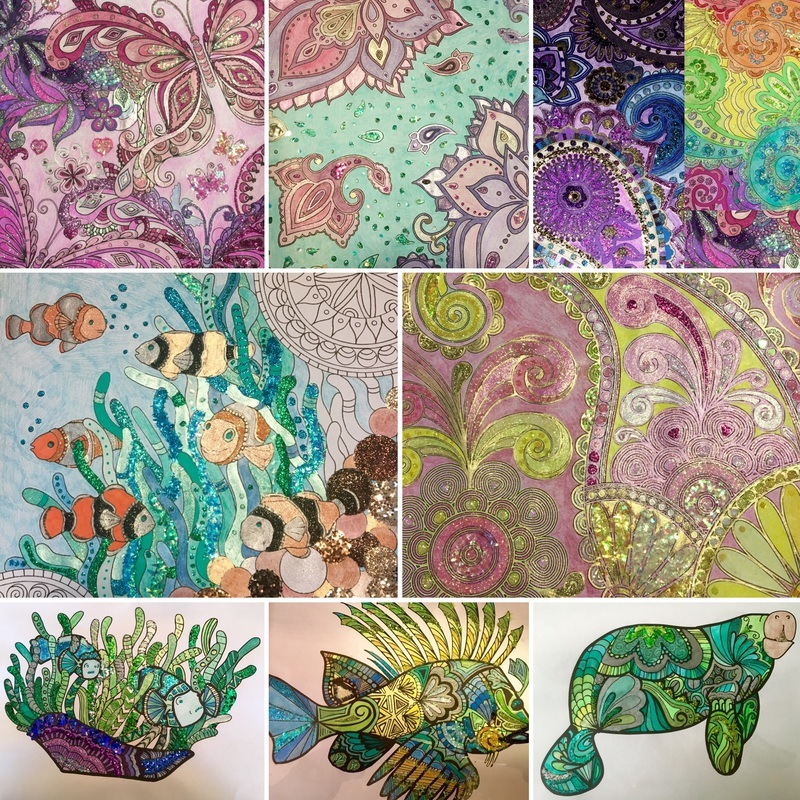 I have been using glitter in my artwork for over 10 years and it has been a signature element to my aesthetic and process. In fact, I am often referred to as the glitter queen" among my audience. 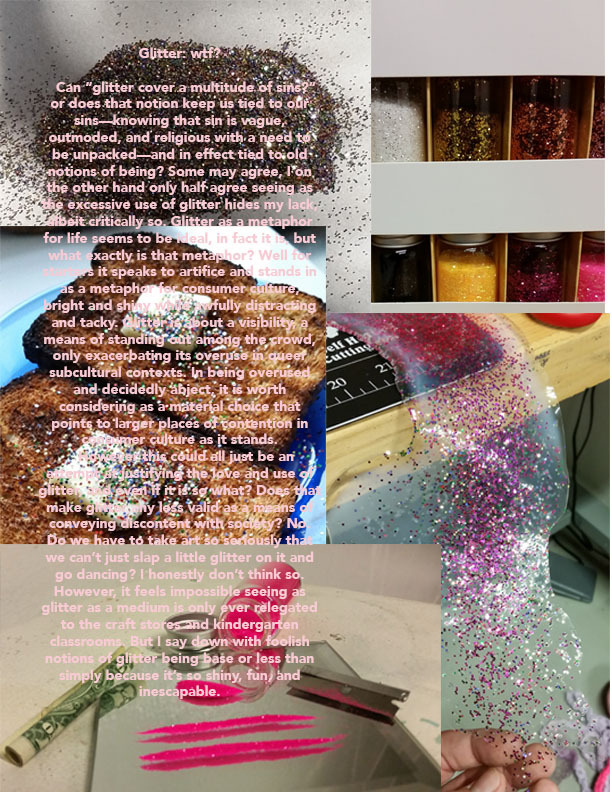 I have been so obsessed with glitter that i even taught a series of public workshops called "Glitter 101" were i taught the history of glitter as well as introductory techniques [FACT: most people use glitter incorrectly, which has given it its bad reputation for getting EVERY WHERE]. My work has been featured in galleries up and down the stated and in Mexico and I have been featured in magazines such as Lowrider Magazine and Teen Angels. I don't just love glitter, I AM GLITTER. I attached a few images of my artwork for reference and I will leave you with my life motto- "Life is short. Be sparkly"
I'm a professional artist in St. Louis. 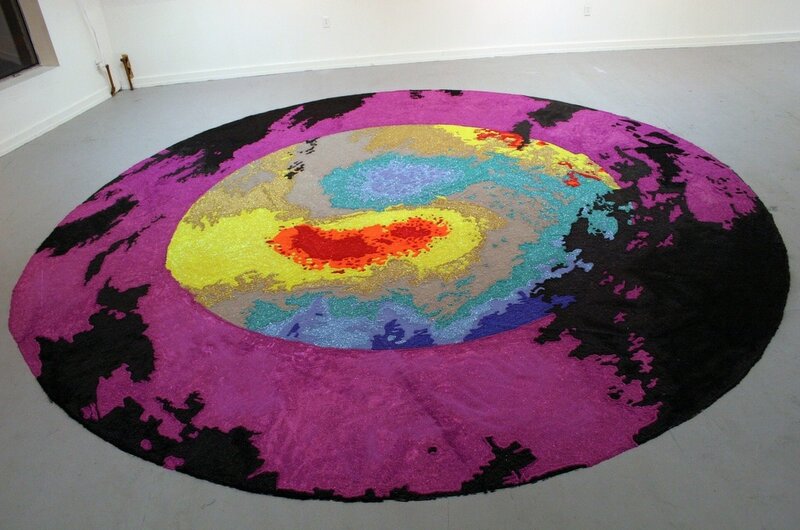 For ten years I have been doing floor installations, recreating Doppler weather radar, out of loose glitter. My largest was 17 feet in diameter and lately they have been between 5-8 feet in diameter. ​Ok.. So glitter runs DEEP through my veins.. I'm a nail tech and an artist/designer.. I use glitter on myself and clients,. And my small business I glitter wine glasses , mugs, yetis, you name it.. Nothing is safe..
A fun costume from Mardi Gras! Note that gorgeous glitter on the mask. We love the creative stuff our Mardi Gras customers come up with! I am a graduate student at California State University, Northridge for ceramics. My work is about fashion and pop culture. I have been incorporating glitter in my work because who doesn't love glitter! So now I am known for being the glitter queen in my program. In my studio there is always glitter everywhere and I love it! 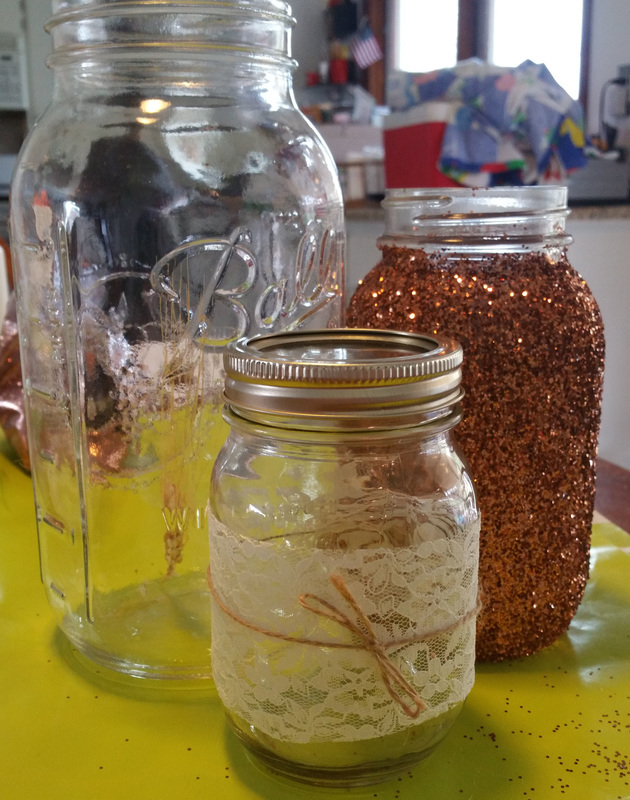 I am interesting on saving money and to buy the glitter in bulk for my bigger pieces. I consider myself a glitter artist. It's rare for one of my pieces to not have any. One of my newest, it needs a title. My next glittery project is to cover the top of my coffee table in glitter and then coat with an epoxy resin. I just need to decide on a color! Awesome idea to unite glitter enthusiastisch like you obviously do. Please accept my application, because I love glitter in every form and color. So yeah, thats all for now. Keep it shiny. I am a proud Flamingo! A float group with the Krewe of Muses Mardi Gras Parade in New Orleans, LA. 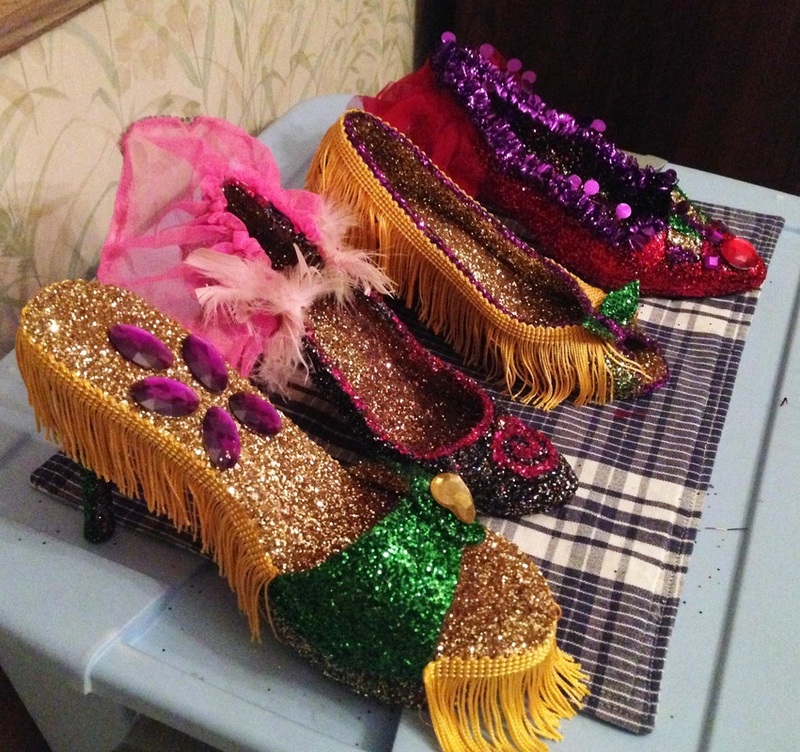 Our parade rolls the Thursday night before Mardi Gras and our coveted Mardi Gras throw is a decorated Shoe. It started with stiletto heels but now just about anything goes. This year my shoes have a Natrually N'awlins flair as most will depict a Louisiana Hot Sauce such as Slap your Mama & Tabasco. Hello first off I love glitter & working with it. I'm a designer out of Memphis,Tn. Now about these beautiful high heels I customized ...I call them "DIAMOND" ....why? Because when your hold a diamond up to the light and look into it thats one of the most beautiful things ever & so are these high heels. 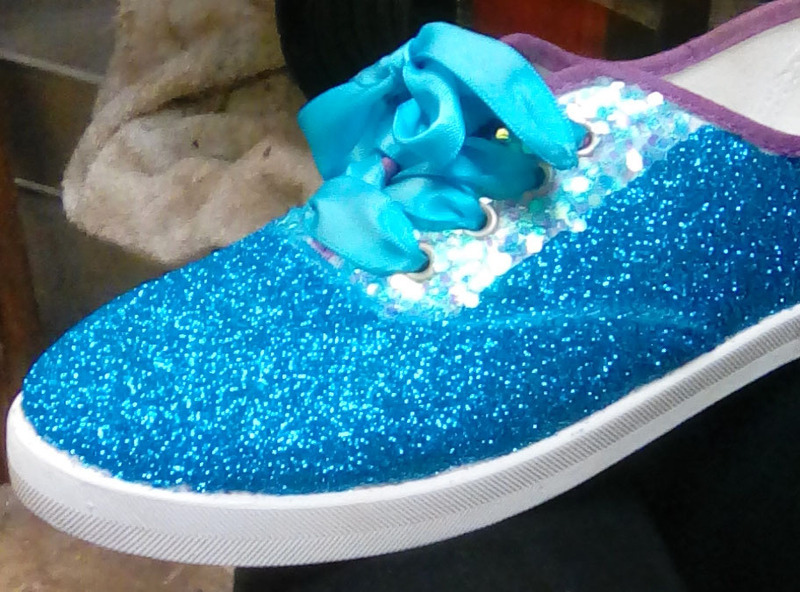 They are all hand made and my customers love them hopefully they look good enough to get me into the GLITTER CLUB! Glitter is life! 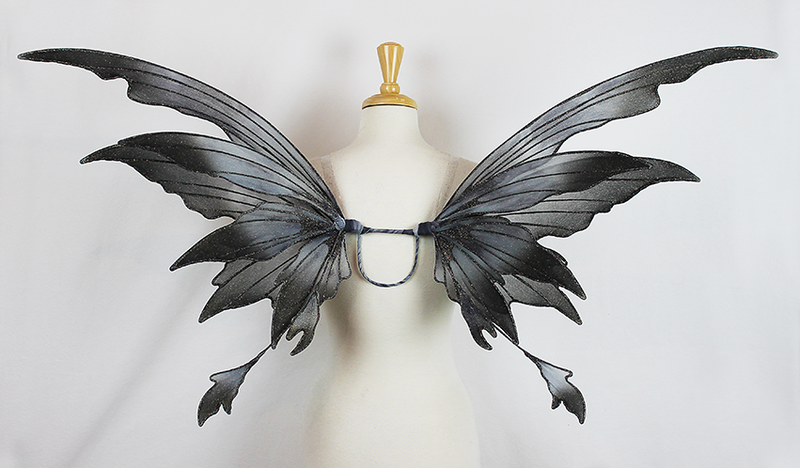 I own a business making fairy wings (amongst other things), and glitter is a *vital* part of making my work come to life!! I do contract work for Disney, and my wings can be seen in their Pixar Parade! Recently, I've started making unicorn horn crowns where the horn is completely covered in glitter! SO very glad to have found you!! "The image that I'm including here is called Hear Me Now. It's 4'x4', and was created to try to help represent the repression of women over time. In this painting you'll see the magic and beauty of this gorgeous woman trying to be heard, with an ambiguous scarf (of man) silencing her. This is one of the paintings shown in the San Francisco, Deca- Show." 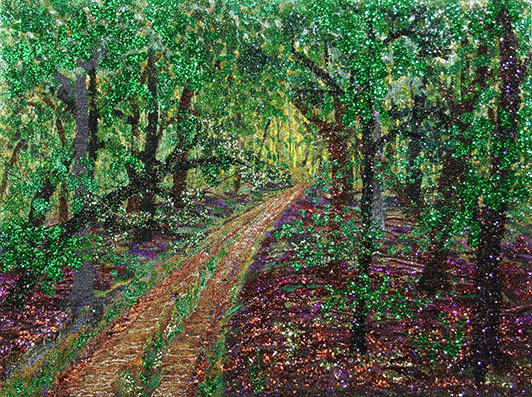 To see more of Arrian's impressive glitter paintings please visit his website at: arrianyveswheeler.com It is worth the visit! 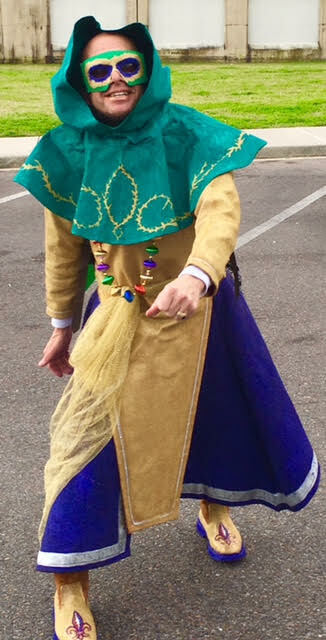 I'm a member of the Krewe of Muses Mardi Bras parade in New Orleans, LA. Glittered shoes are our signature throws. I glitter 30-40 shoes a year ( see attached pics). 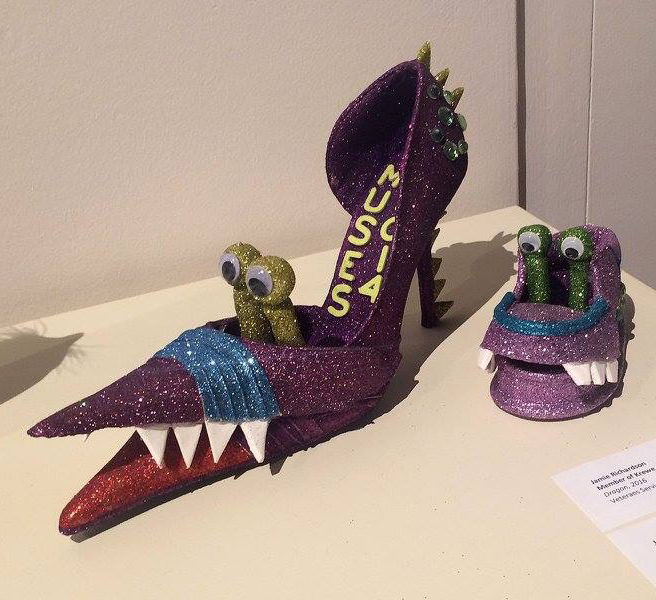 This is a shoe I created and it was shown in the Krewe of Muses exhibit at the the Fashion History Museum in Ontario, Canada. 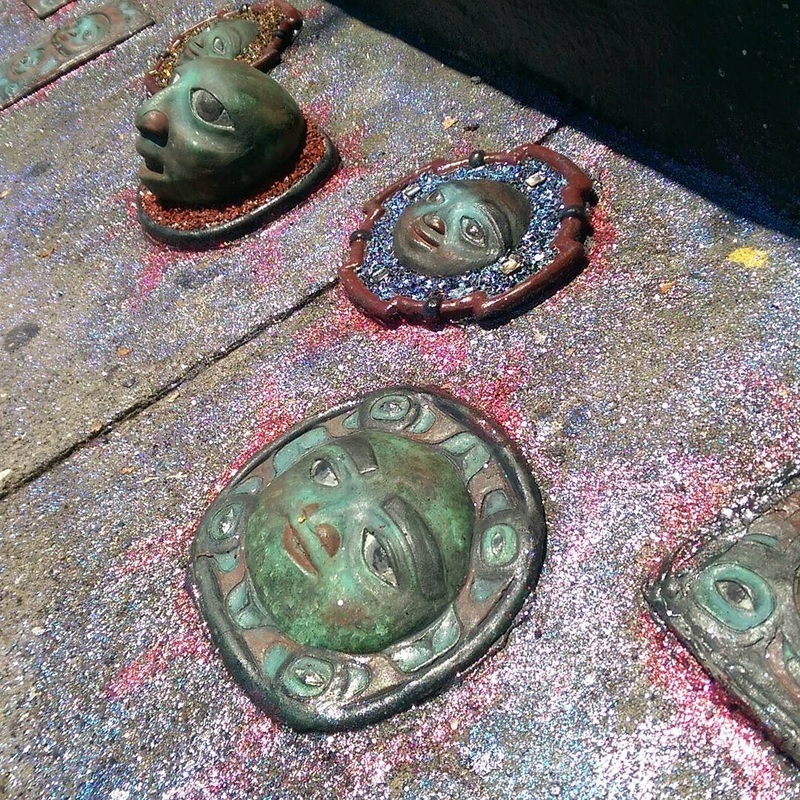 I am a sculpture street artist/public artist in San Francisco's Mission District. I use hand made paints, and have been incorporating luster pigments to improve 'glow'. Also, I have been embellishing my sculptures with 'halos' fabricated upon a base of glitter sparkles, inlaid with shell and semi-precious stones. I have recently picked up a new hobby. It's all about Glitter. I don't know why but I got it in my head that I can make glitter stick to anything. Boy has it been interesting. I started out doing my nails, then on to a picture frame now I'm doing furniture. I'm obsessed. I can't quit. But I love it and it's fun. My friends and neighbors are now bringing me things to glitter for them too. My friends know when another friend has been by because they have glitter all over them. HA HA Love it and it's great advertising. 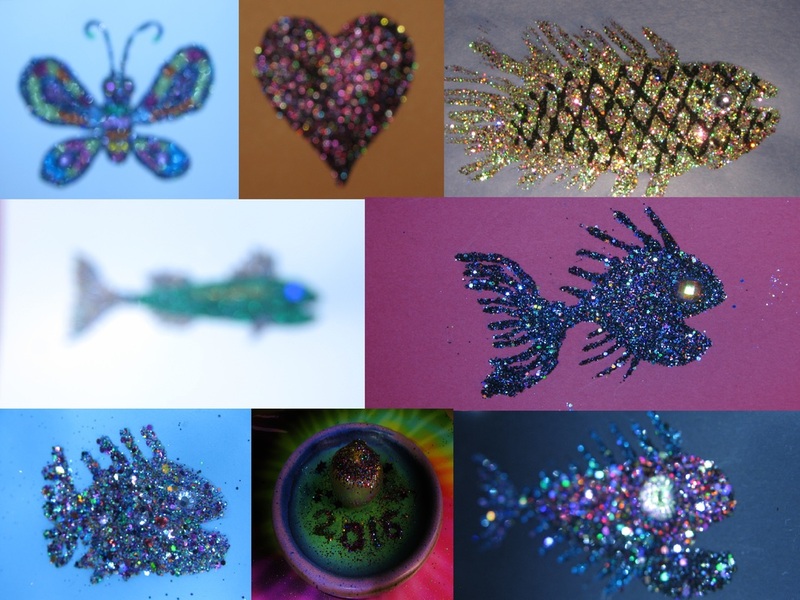 I'm sending you pics of just a few things I have glittered recently. I'm still learning so I'm sure there will be more things to come. I am a Children's Photographer in Austin, Texas. I specialize in Magical Portrait Photography. 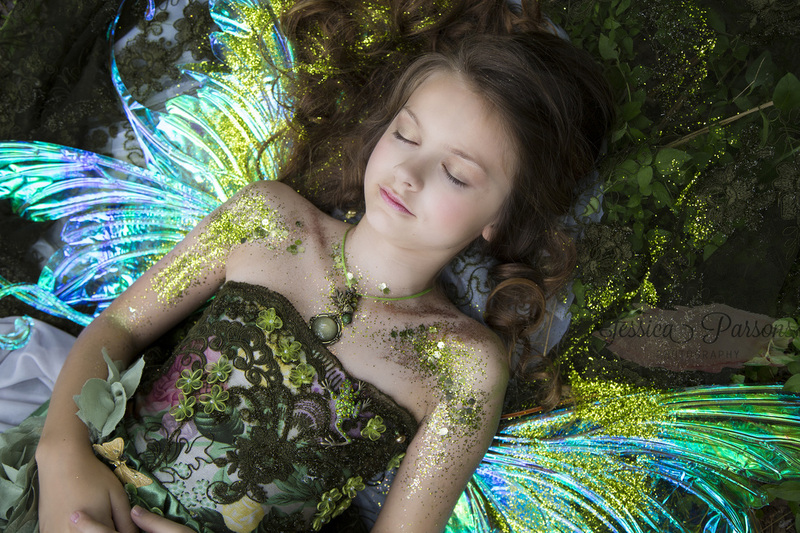 I offer Fairy Sessions and My Very Own Story Sessions (based on Fairytales). Here's an image from my most recent Fairy Session. :) This is a brand new session and has not been published. She's the moment Spring gives way to Summer. All the light new greens turn to rich greens, and the heat starts to get more intense as each day passes. 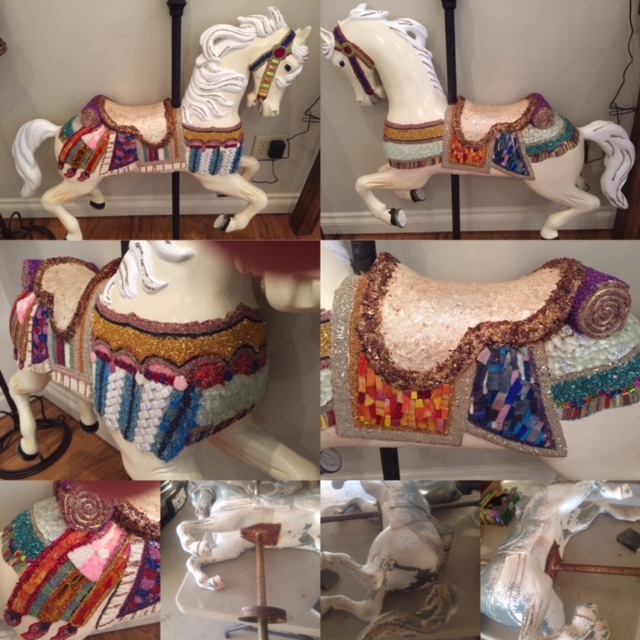 I search for old, vintage carousel horses. Then refurbish, sand, paint, glitter and mosaic them. Then find new homes. I also take custom orders. Glitter is life and life is glitter! 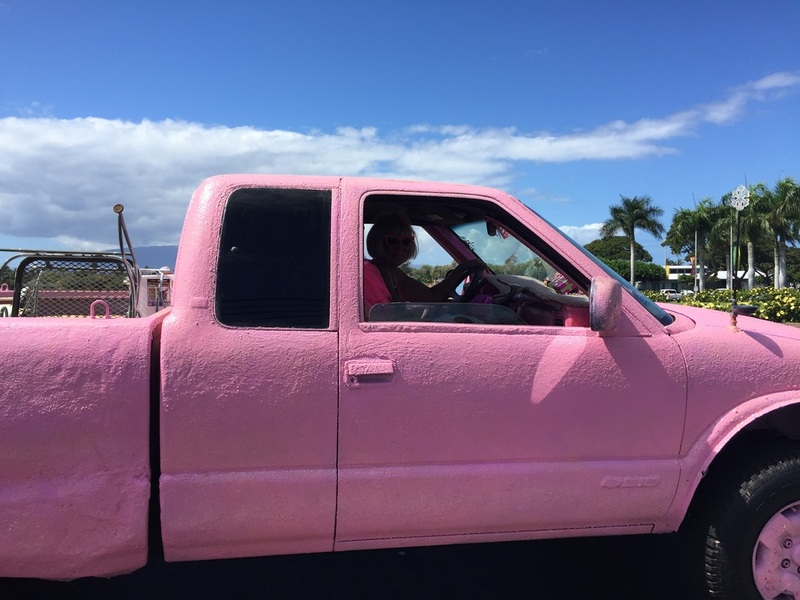 "For 3 Sisters" which supports patients with breast cancer. Let's face it anything with glitter makes people smile! So, I love glitter. I know, common story. But I love working with glitter. I craft handmade jewelry out of resin, and love including different sizes and types of glitter and all manner of shiny items. I love wearing it, creating it, mixing it and god help us all... I definitely love buying it. I know that's not super dazzling, but I hope you think my applications for glitter are, and feel my deeply unending love of all things glittery. Two of my friends and I created a 3' tall 6' wide pink glitter donut sculpture. We used glitter ordered from glittermyworld.com (6 lbs of perfect pink). Thank you for your high quality service and glitter! 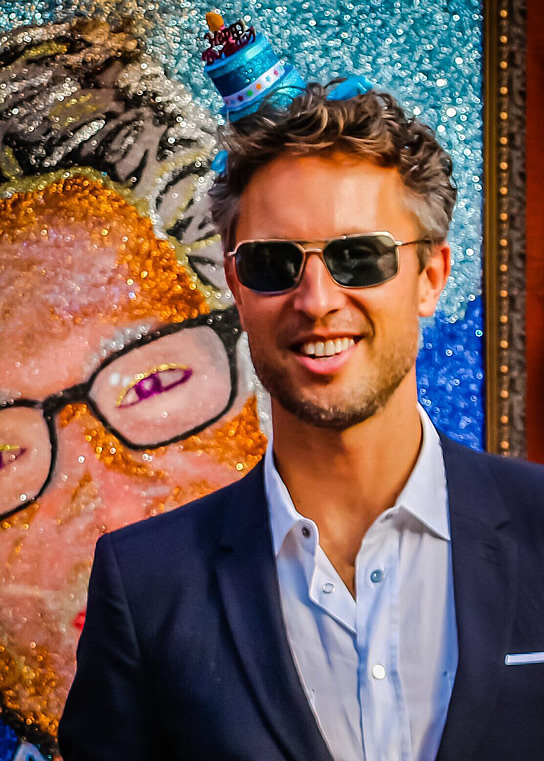 ​Daniel Schwartz, is the co-artist of this project. I work at the North West Children's Theater. and I am a designer and scenic painter. Glitter is part of my way of making our sets and props look magical and alive. Adding glitter to our shows is a huge part of what makes them so wonderful and spectacular. I have been painting here for over 10 years and making things glitter. I have just started using your amazing product. It's the best I have used. I intend to glitter all the worlds we create on our stage. Hi there, I love glitter so much and right now glitter is just everywhere. 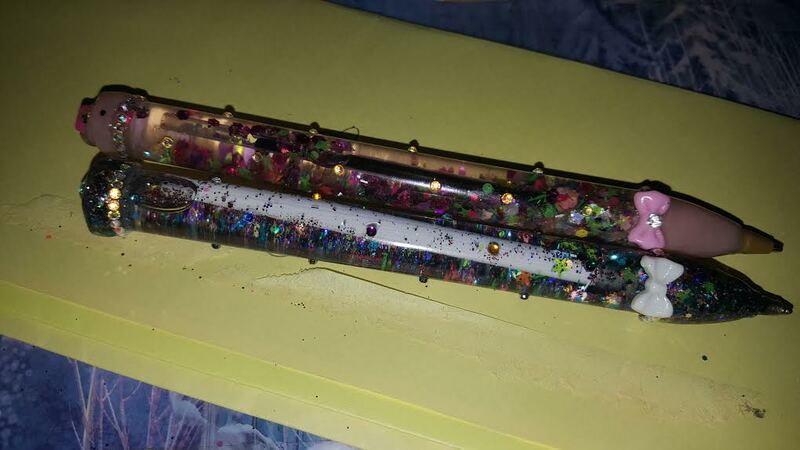 But I had not seen a glitter pen, so I made a glitter aquarium pen. 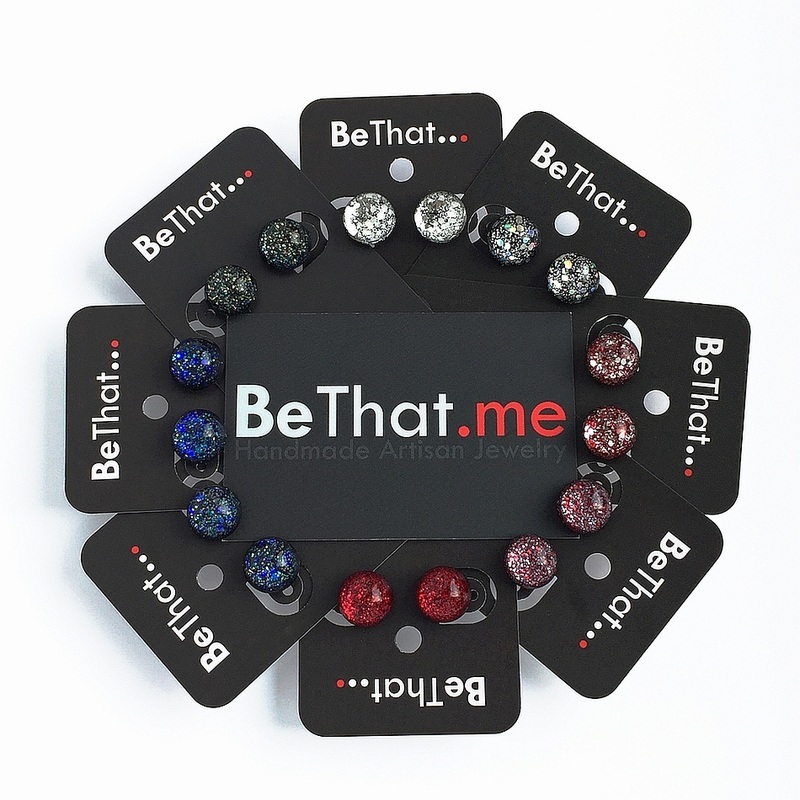 I'm the owner of a small handmade artisan jewelry company named "BeThat." I create with glitter almost everyday. One of my specialties is resin jewelry with glitter. I've been playing with your glitter, and I love it (see attached photos). Also check out for more examples. I love your idea of a community of glitter lovers and can't wait to share with others. 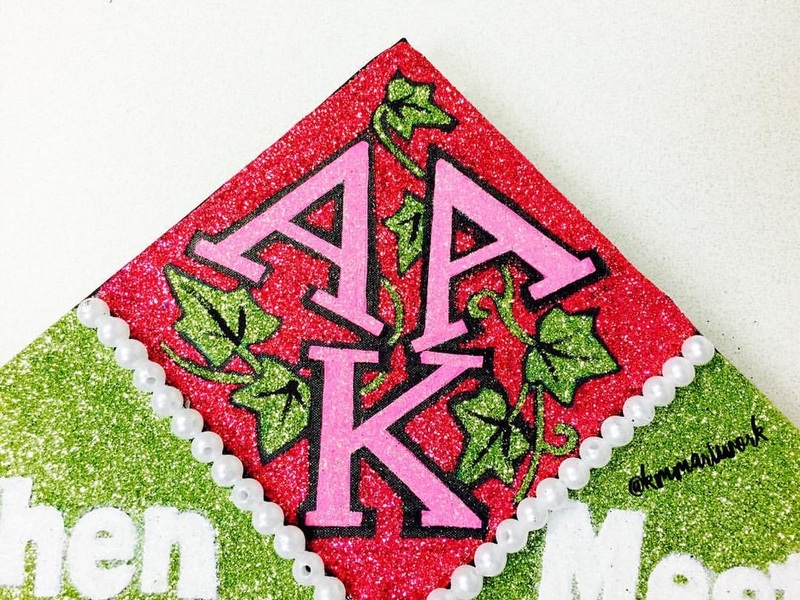 I've always loved glitter but I have become a big fan of glitter now that I design graduation caps. I am constantly going to Hobby Lobby to purchase glitter and it never dawned on me to order online. I found you guys and I am so happy that I did. Please check out my instagram page and facebook page @kmmartwork (instagram) or KMM Artwork (facebook). I hope that you love my work as much as I do. I am still learning and hope to one day be able to be one of the greatest glitter artist in the world. Thank you for your time! I'm a decorative artist who has always had a love for glitter. Have been nicknamed the "the glitter girl" and "dirty glitter" in the past, and I actually made a necklace one time that I wore around with a vile of glitter as the pendant! I love using it in art and am currently doing an epoxy glitter floor for some fun clients of mine who love glitter just as much as me! I was excited to discover your holographic glitter too! Can “glitter cover a multitude of sins?” or does that notion keep us tied to our sins—knowing that sin is vague, outmoded, and religious with a need to be unpacked—and in effect tied to old notions of being? Some may agree, I on the other hand only half agree seeing as the excessive use glitter hides my lack, albeit engaging critically. Pondering this notion, posited by The Cockette’s as a ruling mantra, can be understood not merely speaking to their practice of hot glue and sequins, but speaking to a much larger cultural context of being visible. Glitter as a metaphor for life seems to be ideal, in fact it is, but what exactly is that metaphor? Well for starters it speaks to artifice and stands in as a metaphor for consumer culture, bright and shiny while awfully distracting and tacky. Also, glitter is about a visibility, a means of standing out among the crowd, only exacerbating its overuse in queer subcultural contexts. Although glitter is overused and decidedly abject, it is still worth considering as a material choice that points to larger places of contention. However this could all just be an attempt at justifying the love and use of glitter, and even if it is so what? Does that make glitter any less valid as a means of conveying discontent with society? No. Do we have to take art so seriously that we can’t just slap a little glitter on it and go dancing? I honestly don’t think so. So this being the case maybe we should all learn from The Cockettes and slap some glitter on top of all of our sins and be done with it. However that is impossible seeing as glitter as a medium is often times only ever relegated to the craft stores and kindergarten classrooms. But I say down with foolish notions of glitter being base or less than simply because it is shiny, fun, and inescapable. The pictures are of the parade presentation sign for the St. Louis Balloon Brigade, a group my husband and I created several years ago to be in the St. Louis Pride Parade. I created the sign 3 years ago,and when not in use the whole thing breaks down into 4 large storage tubs. Every inch of this sign, including the white, is glittered (well, not the back, that would just rub off on everyone's legs!) The variation in the blue is because I greatly underestimated how much I'd need when ordering from here, and then it was too late, I had to scour all the craft stores in the city to get more blue, and of course it did not match perfectly! We have won a parade award every year since entering, at first "best costumes" and then after the creation of the sign we now get "best overall entry". In addition to many many pounds of glitter (over 1.5 inch styrofoam) we also have 11 THOUSAND balloons. After the parade we stand for pictures for the rest of the day and ask for donations for PAWS, which is a non-funded division of St. Louis Effort For Aids. It helps AIDS and cancer patients to be able to keep and take care of their pets with food, vet bills, and foster homes. We help with the question of "Do I buy my medication or do I feed my dog?" Since entering the parade 7 years ago we have raised well over $10,000 for PAWS by posing for pictures one day a year and answering the question "Can I take your picture?" with... "Of course, give me a dollar!" 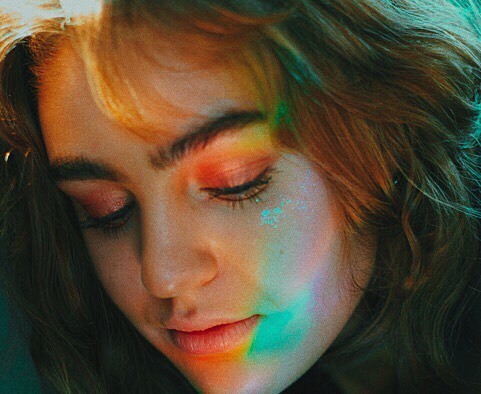 I am an upcoming photographer, and my friends and I often use glitter in our shoots. We're obsessed with glitter and wear it everyday. Here are a few pictures from our series! I love glitter so much I've always wanted a pair of shoes with glitter...well I never imagined I would be able to create the perfect glitter shoes...but I did. And now I want to make more with a variety of color choices. The cupcake holders in the attached picture are just a small sample of my use of glitter in my work. I am a cake artist, and until someone comes up with a truly edible glitter, I have had to come up with various ways of incorporating glitter into my work. 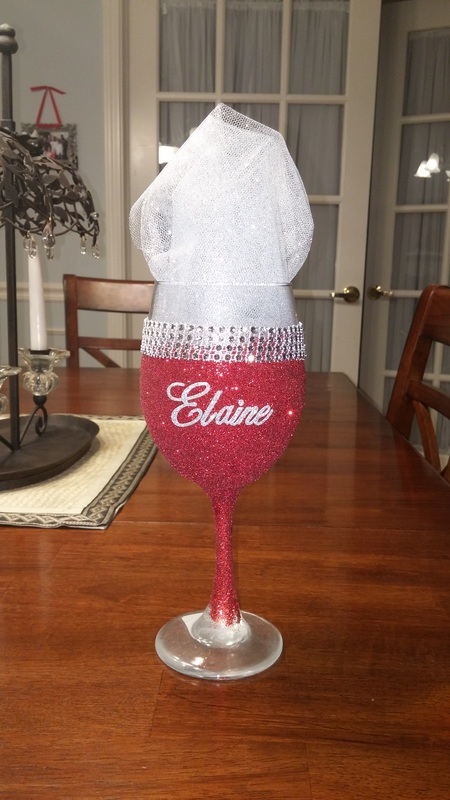 From removable cake toppers (Dorothy's ruby slippers are my best seller), cupcake toppers, cupcake wrappers, and most recently candles, I have found ways of celebrating these special occasions with the magic of glitter! Sooo....I'm a stay at home mom with a small crafting business I run out of my home. I make decorated glassware, mugs, phone cases, shadow boxes and more. Whatever you can think of as I get bored quick and like to learn to make something new. Which is always glittery. I discovered your site and was beyond thrilled that I could buy glitter by the pound. Right after I received my first shipment my 2 little girls (5& 2 yrs old) both desired it would be a good idea to dump two brand new bottles of glitter on their heads which took a week to get out, and then smear tooth paste all in it for extra "hold" so it would stay on their bellies. I use glitter to do many projects!!! Frames that are used for parties to take pictures, centerpieces for parties also, I just love glitter!!! I was asked in Kindergarten what I wanted to do when I grew up. I told my teacher that I either wanted to be an astronaut, or I wanted to play in glitter all day long! My teacher would be proud of me, I do in fact play in glitter ALL DAY LONG!! I make glittered yetis! 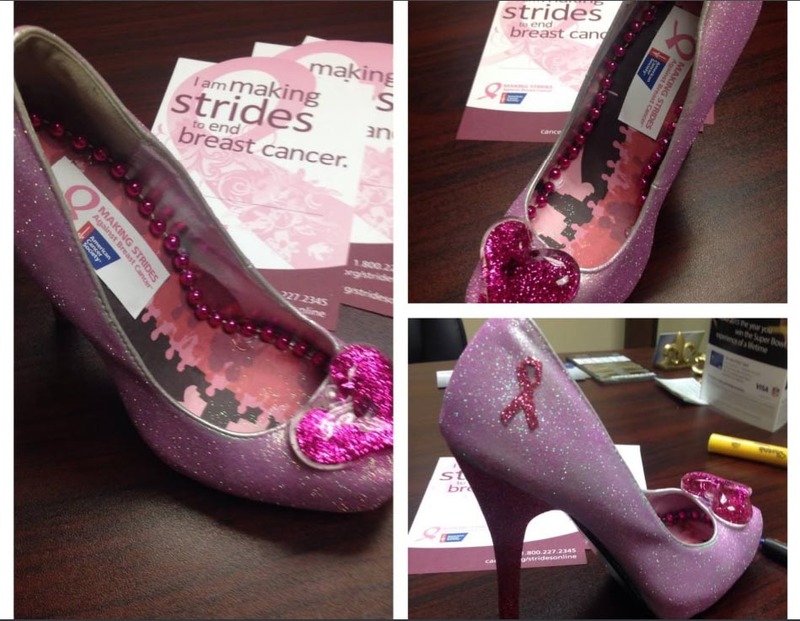 One of the shoe designs by a member of the New Orleans Krewe of Muses. 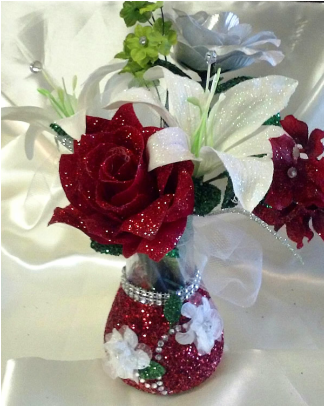 Here's a pic of my wedding centerpieces... it's a rough mock up but, I will share more pics once i finish them. I love the bronze glitter. I must say I've just begun my journey with glitter. I have always used stones for my work. 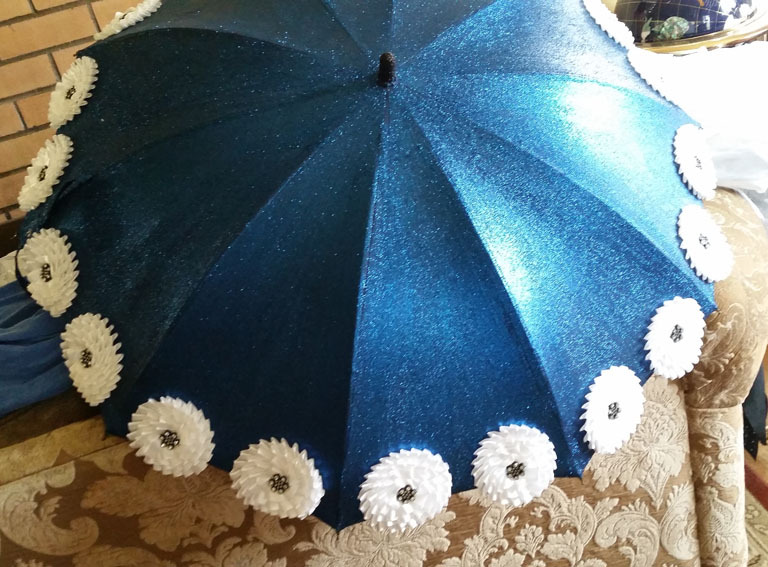 I did an umbrella last year and my love went from there. So now the question is before i begin a project is stones or glitter? I love them both! 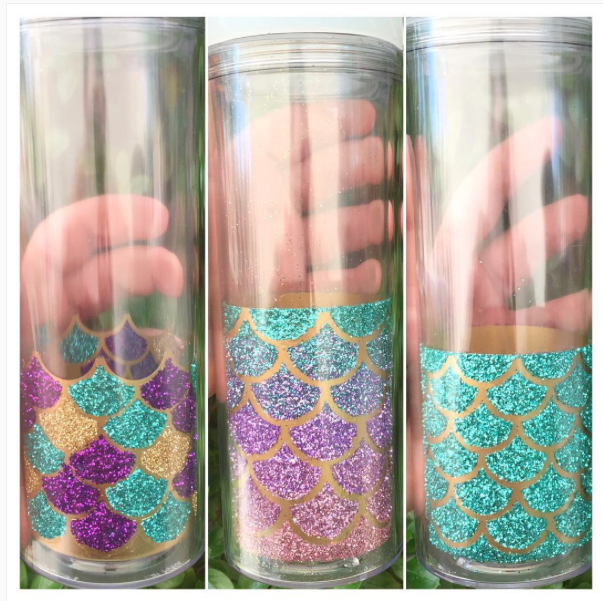 I mainly make glittered drinkware, and my favorite thing I have made recently is ombre mermaid scales! I love everything that involves glitter, maybe it's because I was an only girl and somehow ended up with three little boys, a husband, and a boy dog so I feel the need to overcompensate with glitter. My husband always has glitter in his beard (always) as well as males you come over to my house for their printed orders (I run a small print shop) they tell me that their significant others always know when they have come to my house that day for an order because they come home with glitter on them! I have attached a picture of one of my favorite mermaid cups but please feel free to check out my instagram! 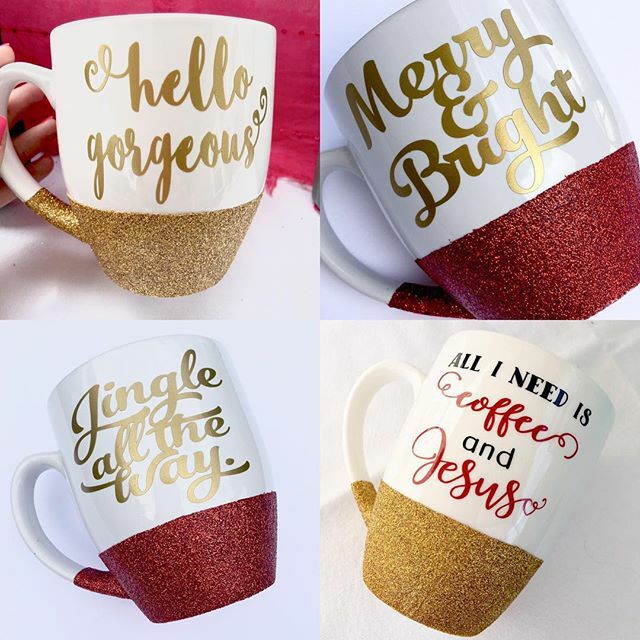 Here are some of my favorite glitter posts! I have had work on the Tonight Show with Jay Leno and have works featured in Bob Marley's Miami and Jamaican Homes. 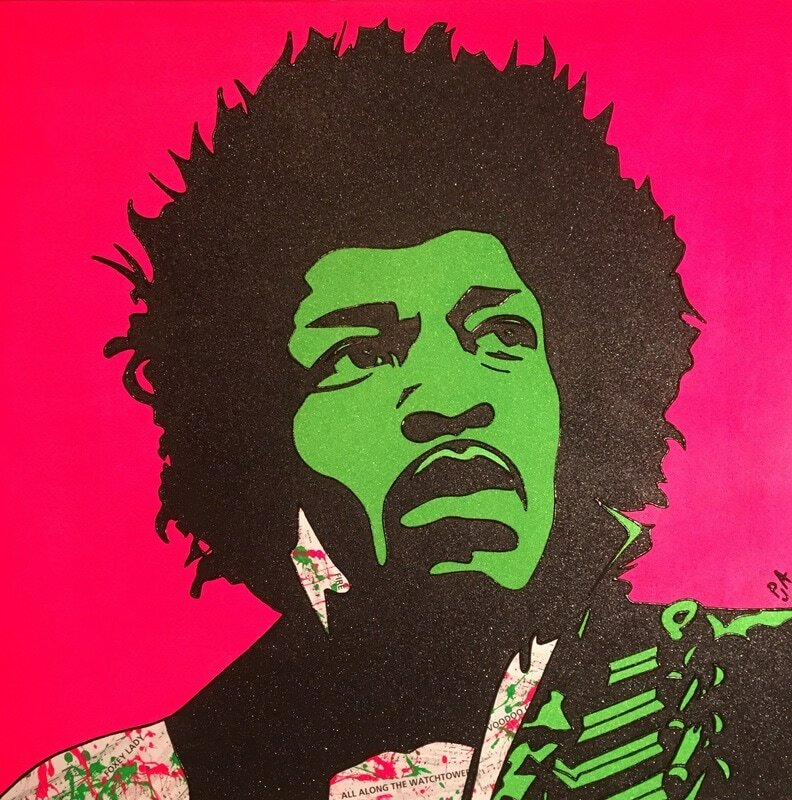 Owners of my art include Grammy award winning musicians Dr. John, Arron, Cyril, Art and Charles Neville (The Neville Brothers) and Ziggy Marley among others. I love all things glitter. People know this about me and always try to get birthday cards and anything for me with glitter on it. I love to sparkle! 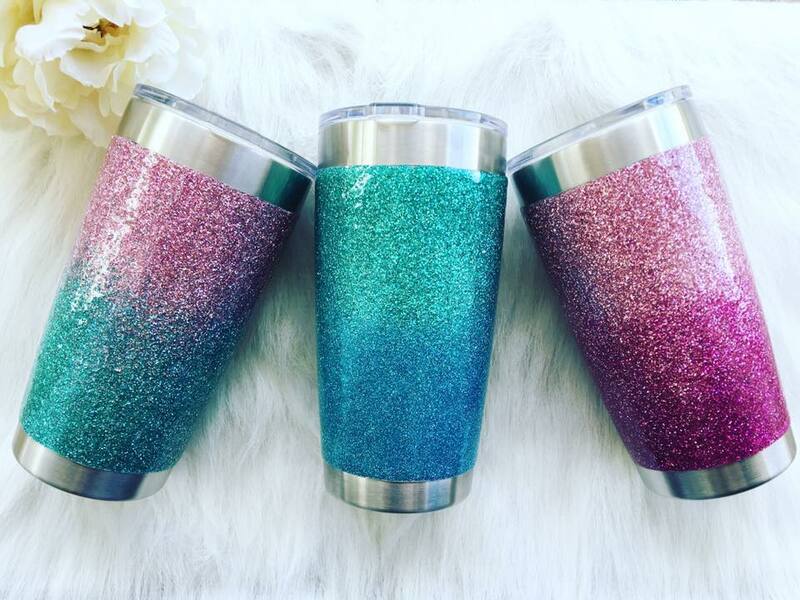 I have recently taken my glitter love to a new level when I decided to try my hand at creating a sparkled YETI cup. 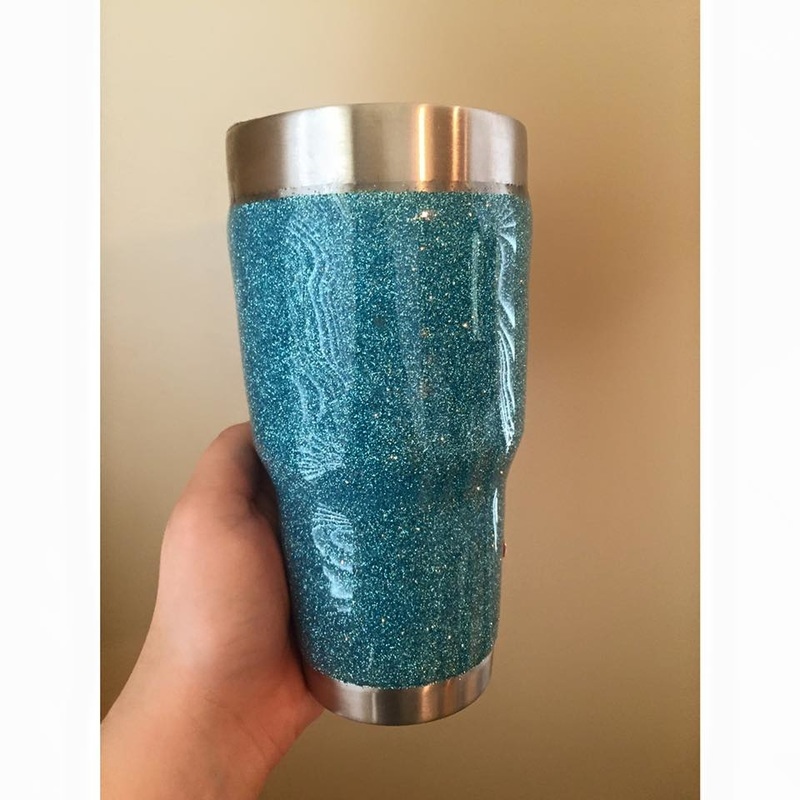 I loved glittering this and I bought three different colors of glitter, mixed them together and glittered this YETI cup. I run a small ETSY shop called LenoreLoves. I started my shop a year ago as something to do while my kids were at school. My shop started as handmade gifts decorated with buttons or paint, but then I discovered glitter! I started glittering candle holders, vases, serving trays, wedding favors, paper mache letters, and anything else someone asks me to do. My business grew very fast and my house is always covered in glitter! I paint because it is completely engaging and difficult. It requires me to learn new things all the time. When the work is going well, I am deep in concentration and one with my materials, and I feel productive and useful. Currently I am working with glitter, which both flattens the picture plane and enlivens the light reflecting from the painting. Glitter suggests the tiny, overall movements that are present in nature. It is also almost unphotographable, which is a virtue in fine art! I have recently become obsessed with glittering everything I can get my hands on. 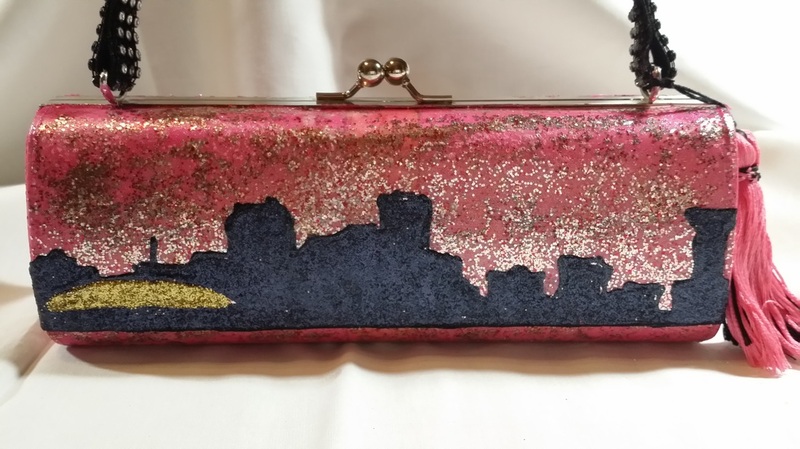 As part of a mardi gras krewe who decorates purses I have and need a wide variety of colors and styles. I always need more. 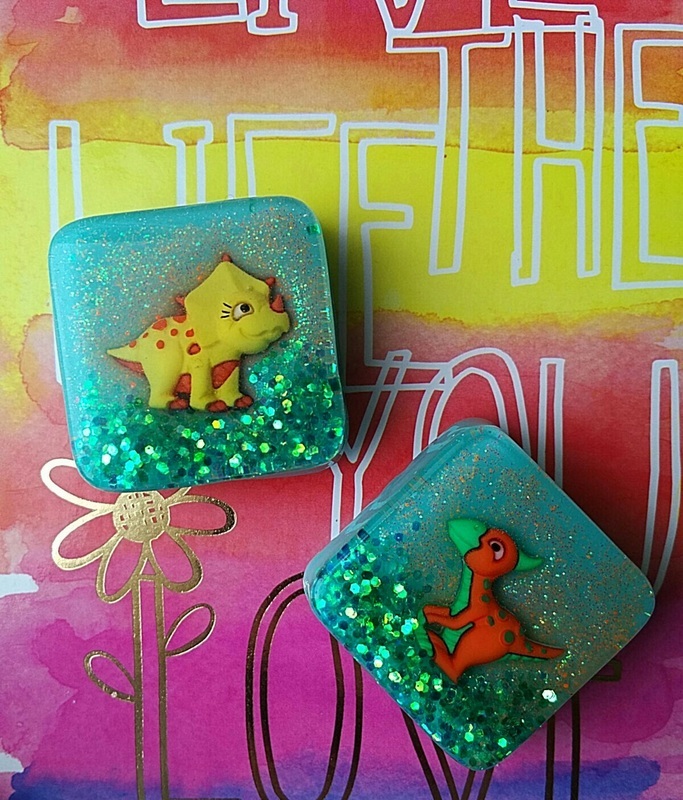 I use glitter in my resin projects. 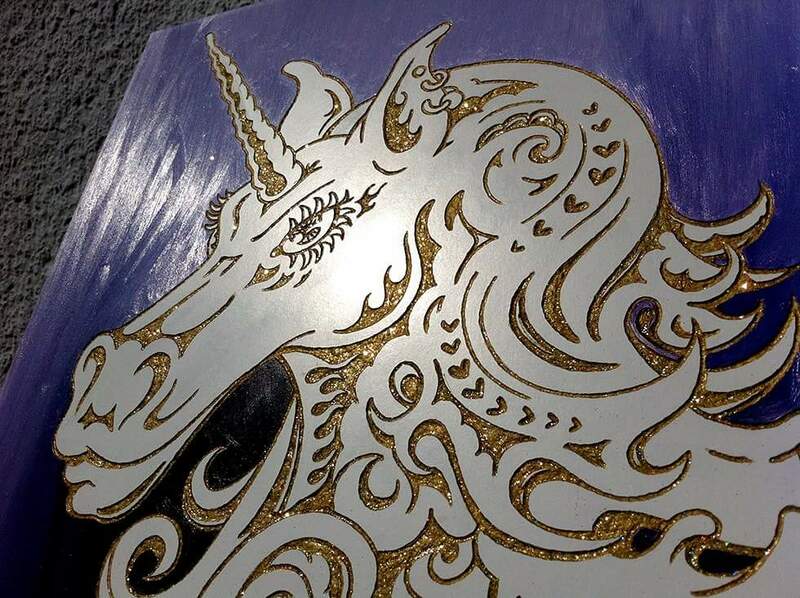 It's a FANTASTIC way to see the exact texture of the glitter, and it really helps make the piece pop! We agree! The depth and dimension achieved in these little gems is great! This large dancing coyote was made using gatorboard, lots of modge-podge and glitter. He was used in a performance at the State theatre in Austin, TX. 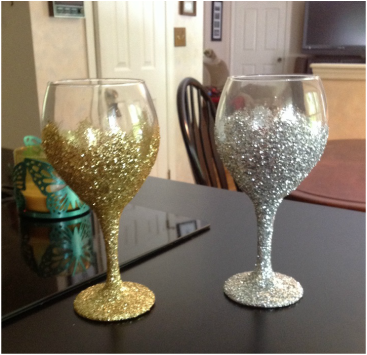 I love glitter so much it is the basis of my Etsy shop, Wine About Jewelry! 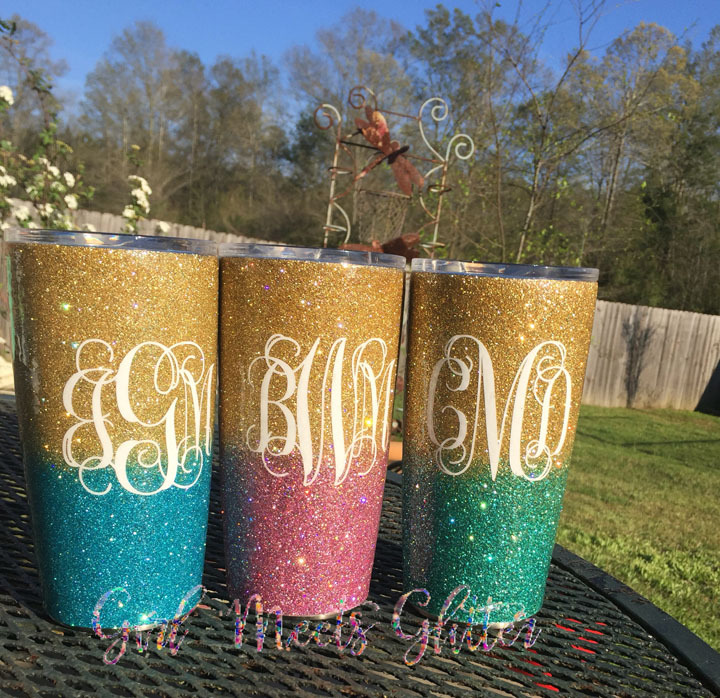 Where I create hand dipped glittered wine glasses and glitter dipped coffee mugs for those who want to enjoy the sparkle in all of life's little moments! I love sparkle and things that shine so much I'm pretty sure I would bleed glitter. This elegant glittery scene is from the wedding of one of our Glitter Club Members! She had a blue and white glitter wedding, complete with glitter name plates, glitter votives, glitter glasses, glitter globes, a glitter isle, a glitter mailbox to put cards in and sparkly shoes and glitter nails! My first glitter project was in October for my friends 40th birthday party. I made a 4 ft. square glitter portrait of his face. Which, for a first piece, was far from perfect, but still a huge hit! Made with lots of love and glitter. ​Since then I have made several other pieces. I am inspired by the work of the late glitter artist Renée Garcia. I unfortunately never got the chance to meet him. I wish I did, his art is amazing and I aspire to make glitter art like his (someday). I have been a jewelry artist for 20 years working primarily working with resin and sterling silver. The Mystic Krewe of Nyx throws many things from our floats to parade goers: blinky beads, plush toys, koozies, plastic travel perfume bottles, sunglasses, and many other items. However, our signature throw is the glittered purse! These are prized by parade goers because they are limited. 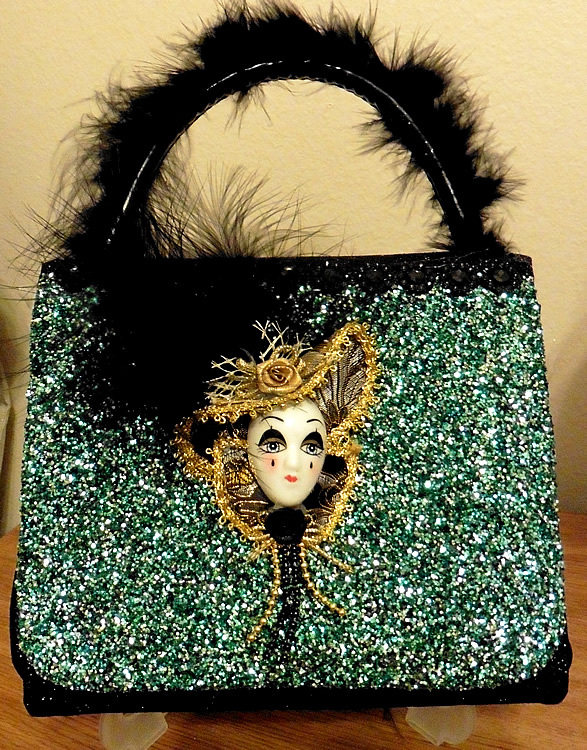 Each rider can only throw 20 glittered purses per parade. But, even just 20 (plus the many others that are gifted to family and friends) creates the need for a LOT of glitter. 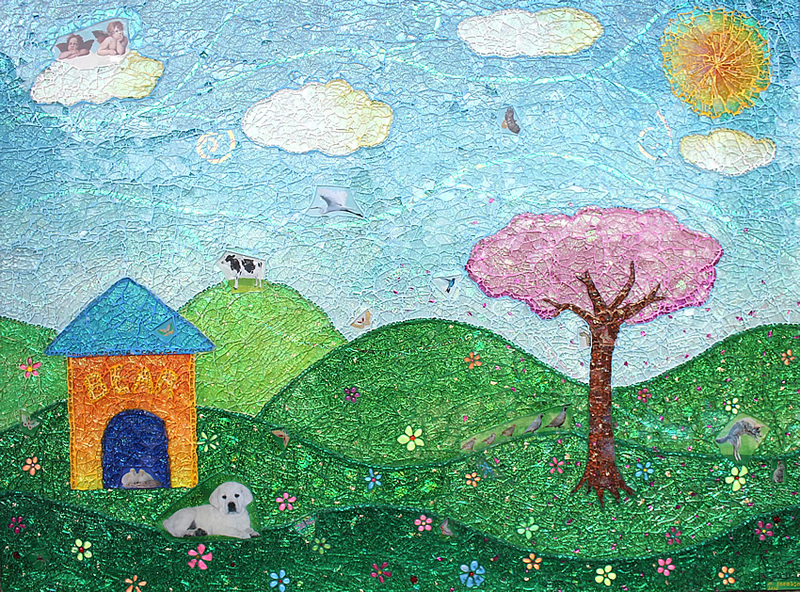 This picture is of one of the latest creations, made using your Bermuda Dreams glitter. 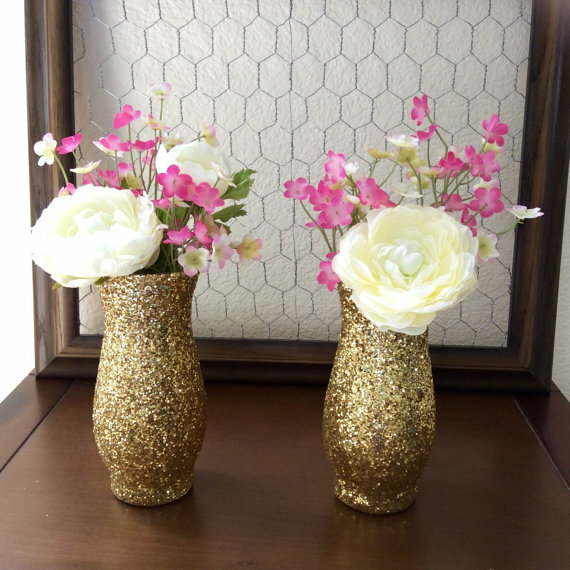 A customer sent us this great photo of some wine bottles sprayed with gold paint and covered in glitter. The glitter was left rough (not laid flat) which really makes the light catch it. Fun use of color blending too! This group makes glitter art in the sand, lights a bon-fire and dances the glitter into the ground. What fun! The Color Run is a 5K event that is so cool... well just sign us up! Here is the official description: The 2015 Shine Tour is designed to uplift and inspire runners to stand out from the crowd, sweat sparkles, and continue to live their lives in a happy and healthy way. Sometimes a touch of glitter is all a hand made card needs. Subtle touches that say it all! 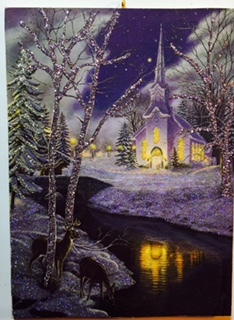 Take a peek at some wonderful cards by our long time friend, Cyndi Fox. 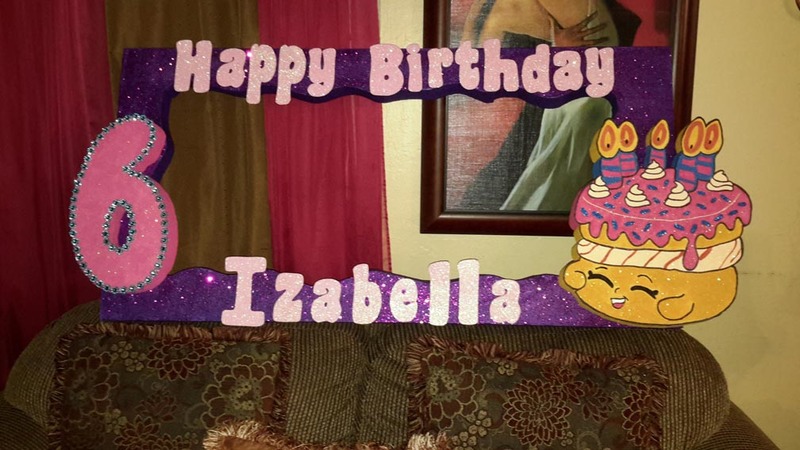 I create custom props for girls and directors for pageants. I use glitter along with 3D items to bring these props to life. My company name is ENCHANTMENTS. 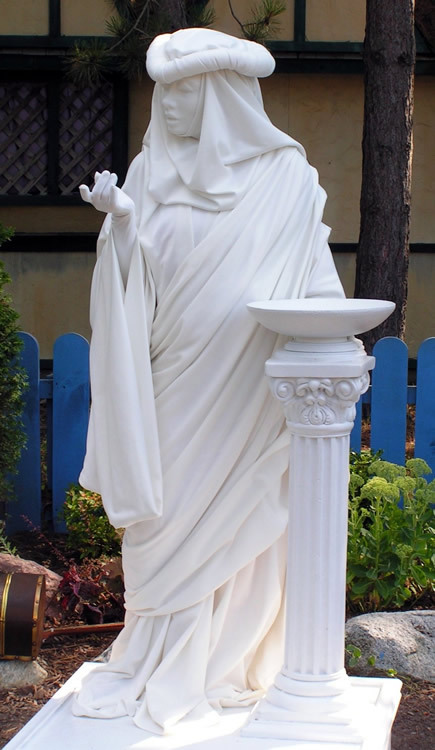 Among other things we provide a series of magical living statues (one shown left). Each statue has it's own story, but all have one thing in common: they shower friends who approach them with magic.This is where the glitter or as we insist "Fairy Dust" comes in. People may be a little resistant at first, but even the toughest men can't help but smile at the feeling of those tiny, fiery, magical 'things' brushing their cheeks...fairy kisses. What a fabulous idea Barbara. You fool just about everyone who sees this image. Well done! Oh yes. We want one of these! 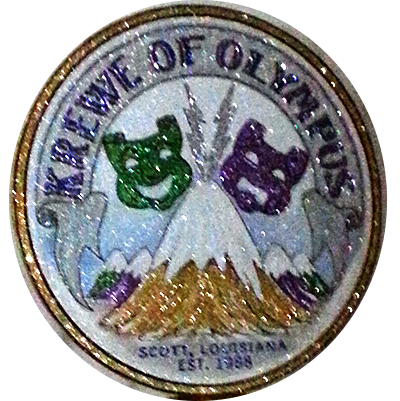 This is a crest that I have glittered for the Mardi Gras krewe that I belong to. It is my design that I had printed, then proceeded to painstakingly glitter. Some of the colors I mixed to get the "shading" effects that I needed for the look. Your attention to detail is fabulous Bettie. Excellent blending too. Really impressive work! As members of the Mystic Krewe of Nyx, ( a ladies parade of Mardi Gras in New Orleans) the ladies and I spend months preparing for one night of excitement and fun! Our signature throws are homemade purses. Well... Not homemade but revived purses. The glitter flows like champagne on New Year's Eve. Below you will find a sampling of the creativity spilling forth from our "church ladies" group! Please enjoy! We love them Sheri! 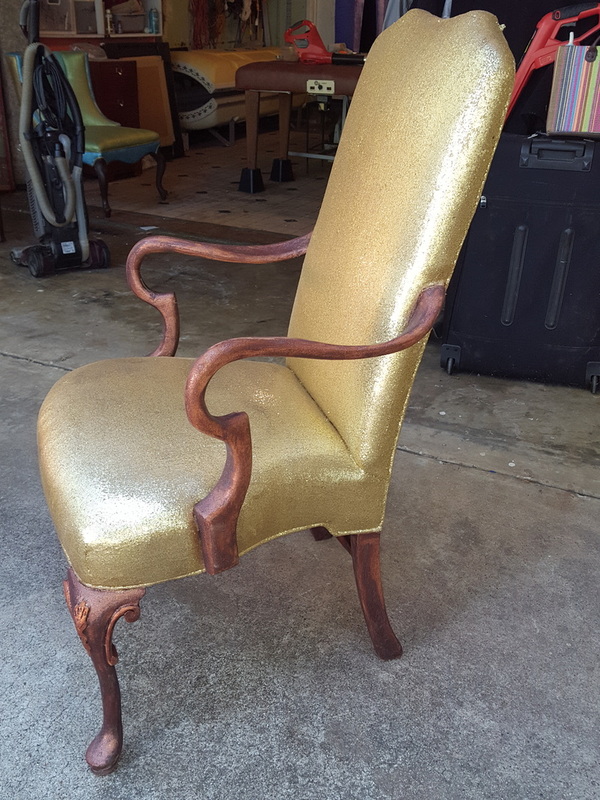 Re-purposing is a noble enterprise and your designs are whimsical and fun! I am a mother of 2 who loves all things that sparkle. I use glitter in my makeup almost every day, which lead me to the idea to create my own line of body glitter pots using all of your amazing glitters. I have created about 65 custom blends and plan on releasing 10 to start with. I also have been experimenting with making my own nail polish that I also hope to sell in the near future. 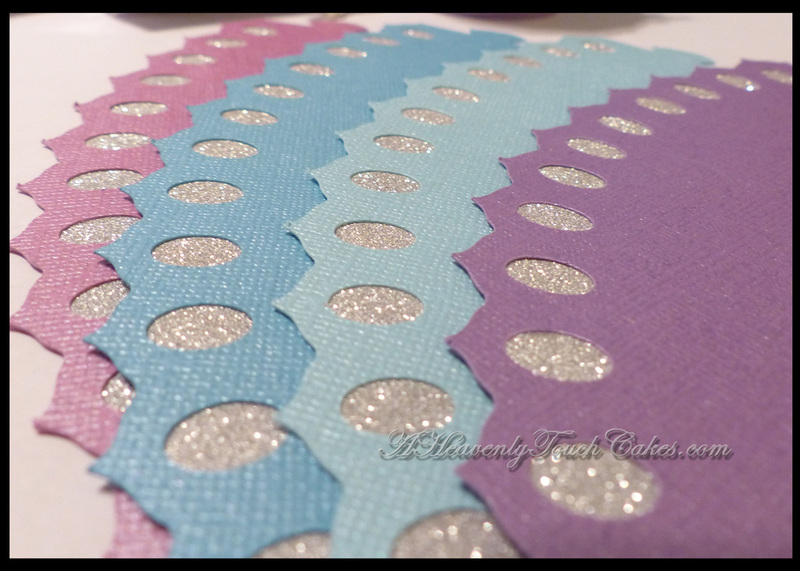 But for now I am loving all the different combinations I am able to get with your huge selection of glitters. Excellent Virginia! We love the blends and please let us know if there is anything we can do to help you get your new business off the ground! You win! 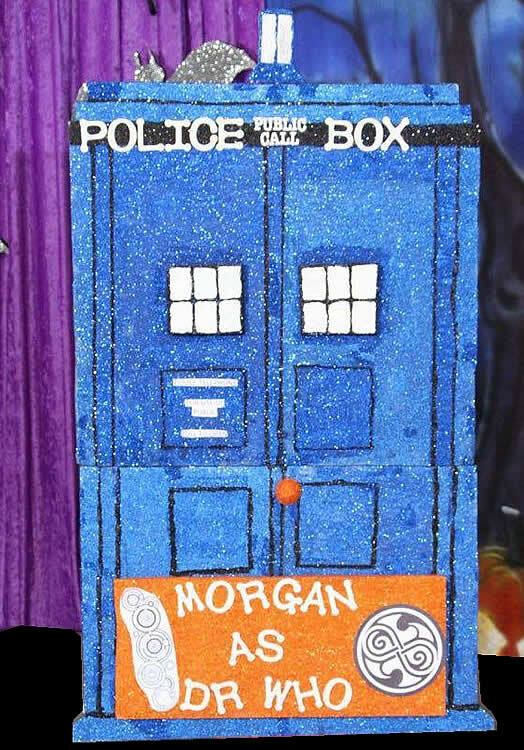 This is just so far beyond a fun use of glitter. Makes us want to throw a dance party! Las Vegas has a sparkling gem called Crystal Cleats. 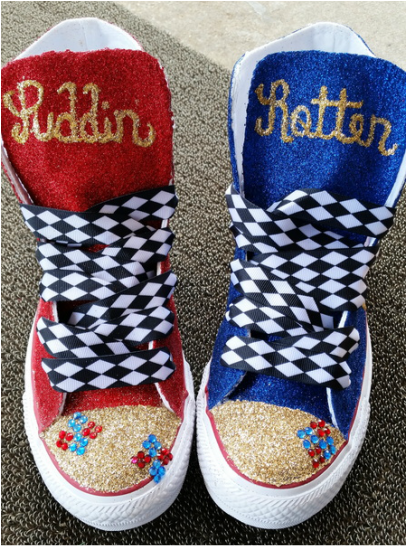 Their hand decorated glitter shoes are just amazing! The best part is they can be yours by visiting their fabulous Etsy store! Jean Hawes is a glitter enthusiast with skill. 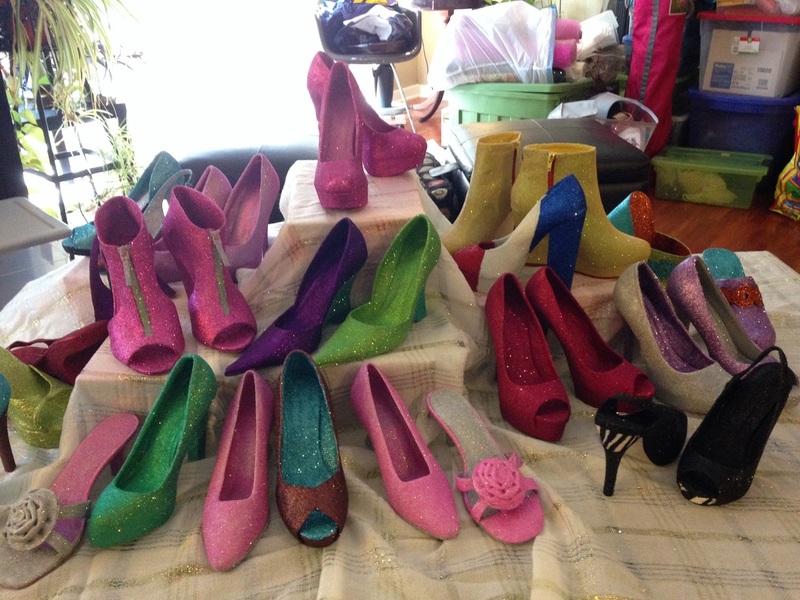 She creates shoes for the Krewe of Muses. 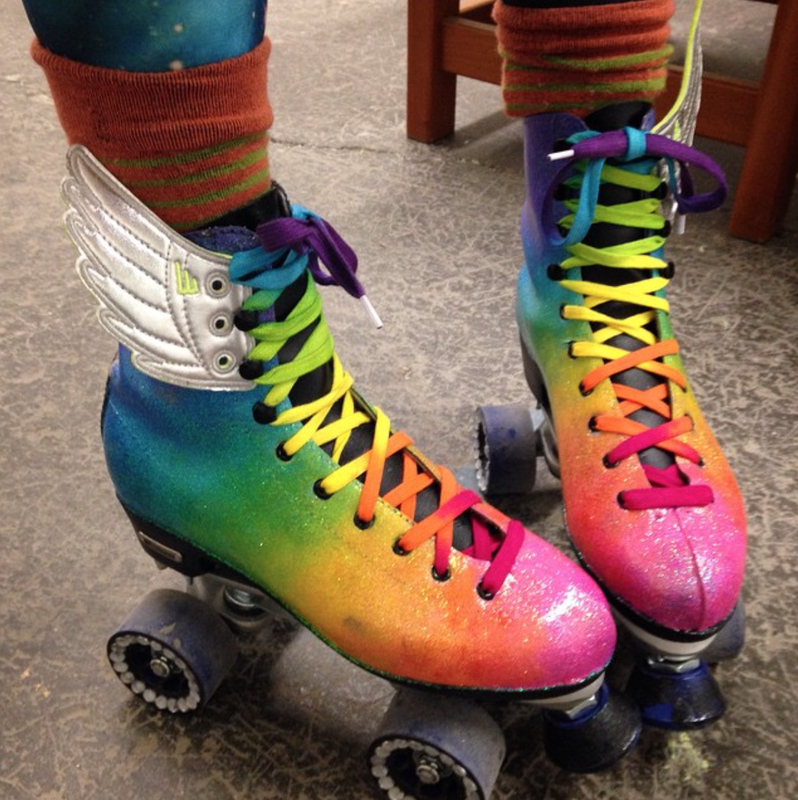 We have seen many glitter shoes, but the craftsmanship on her shoes is truly excellent. We would definitely walk a mile in one of these pairs! Lori is one clever glitter lover! 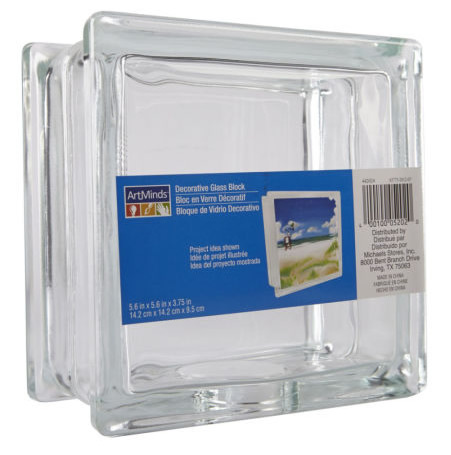 She takes plain glass cubes from Michaels and glitters them on the inside and/or the outside. 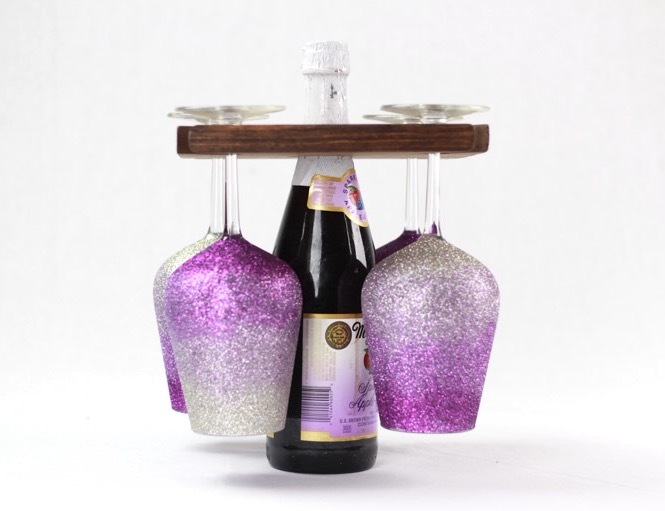 Add accents and cordless lights inside and voila...an eye-catching display to say the least! My name is Cyndi and own Cindy Cinderella Carriages. I have always loved any and everything that sparkles!!! So I came up with my own way of making my horses hoofs sparkle. 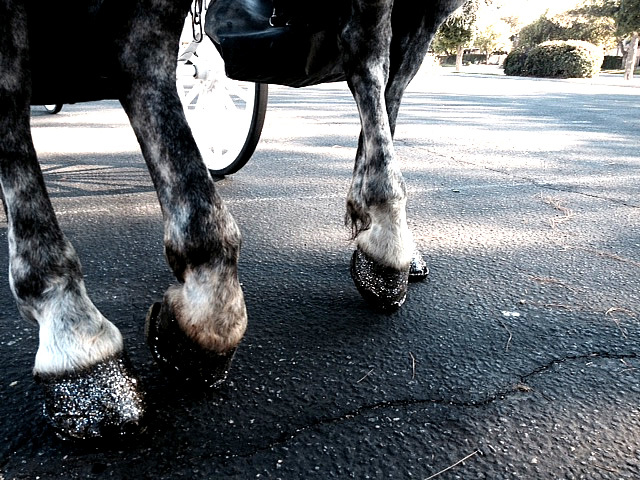 My horses hooves are the hit anywhere I go. You can't help but notice them and everyone comments and takes pictures of their hoof's. 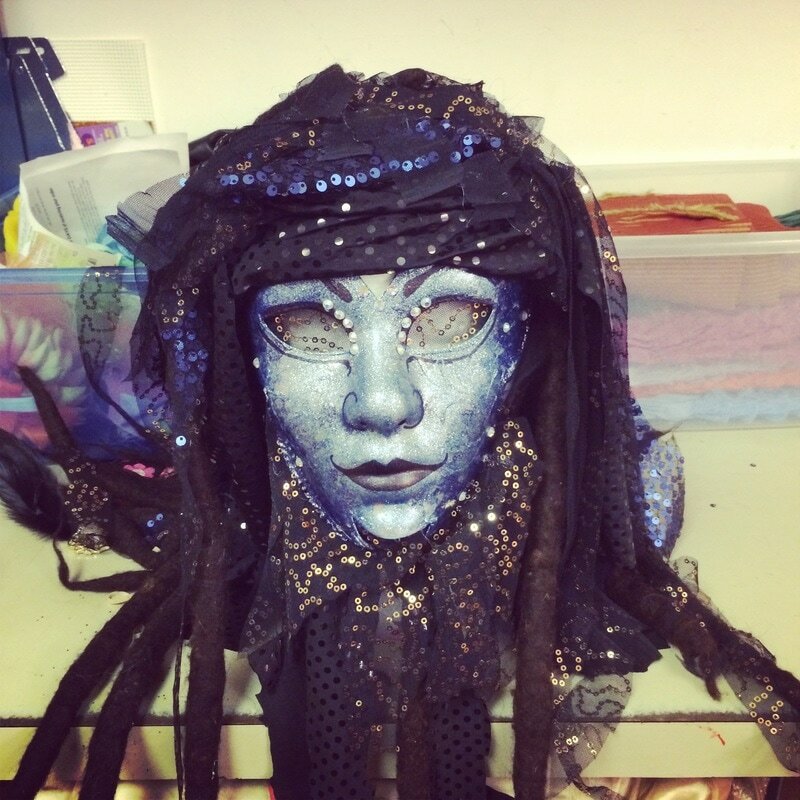 I create custom handmade costumes for dance, performance, and special events. Here are a few of the many costumes I have created. 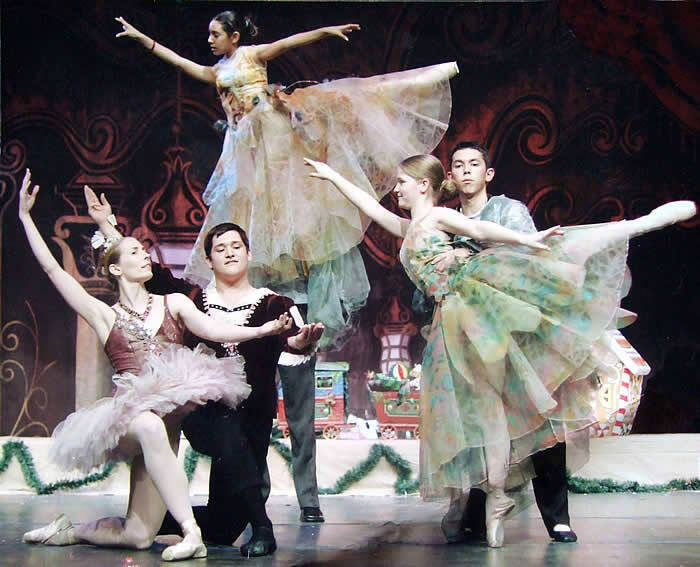 Some of the companies I have worked with include- International Center for the Performing Arts, Friendswood Ballet, and Georgetown Ballet. As you can see, I use a lot of glitter to make these gorgeous dances really sparkle! The artist that created this large 3 x 4 foot glittering painting wishes to remain anonymous. It is whimsical, colorful and perfect for glitter lovers! 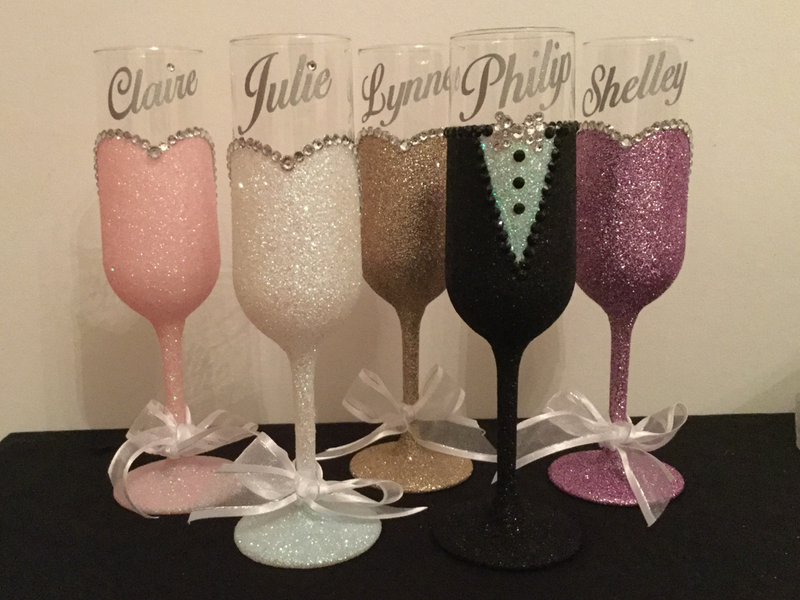 I decorate and design wine and champagne glasses! I'm also venturing out into the champagne/wine bottles as well as party favors! *We have requested more information on where Lechelle is offering these for sale. When we receive that data we will be sure to post it. Her craftsmanship is excellent. I love to glitter the tops of my homemade soaps! 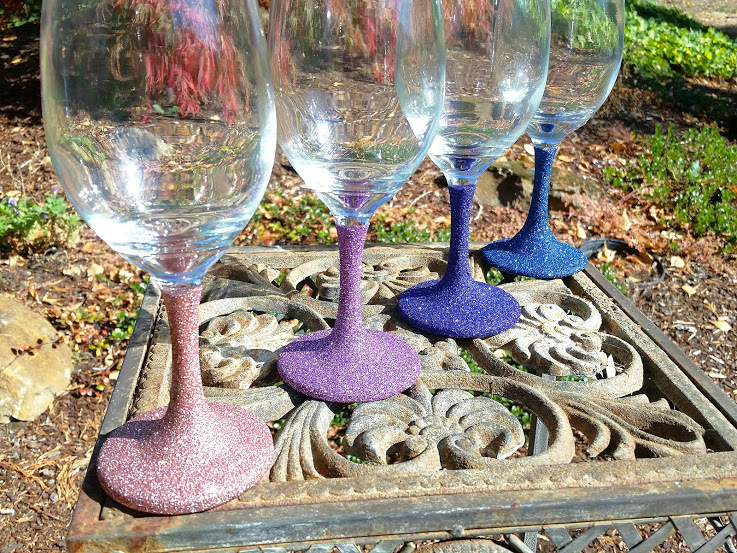 I just started making glitter wine glasses and adding glitter to my hand painted wood signs. ~ Looks like she has the hang of it to us! I work at a free standing Emergency Room and we have started a wall for the whole month of October. For every ribbon we get on the wall honoring someone who has battled breast cancer our owners are going to donate $5.00 to a local cancer society for each ribbon we have. I made the big ribbon in the middle out of cardboard and pink and black glitter. This is a picture when we first put it up. We now have a bunch of ribbons! ~Great cause and a great idea to support it! 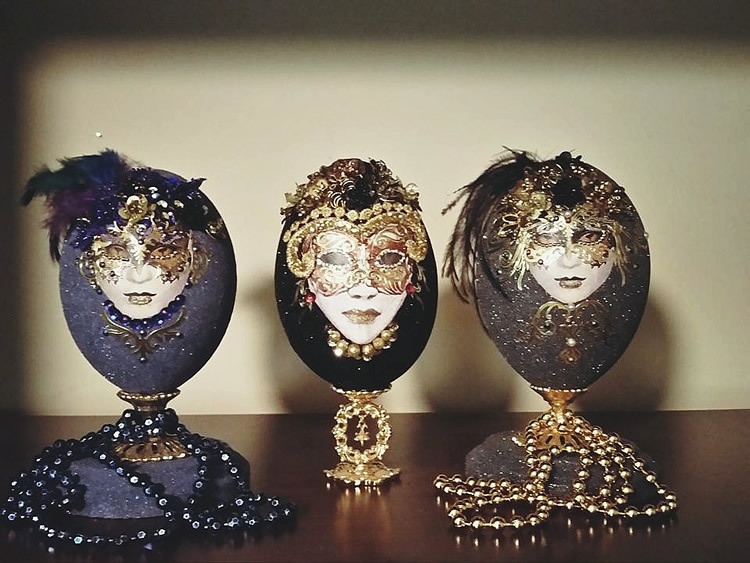 These are three Mardi Gras eggs. They are real Rhea eggs covered with glitter, set on gold plated stands and decorated. 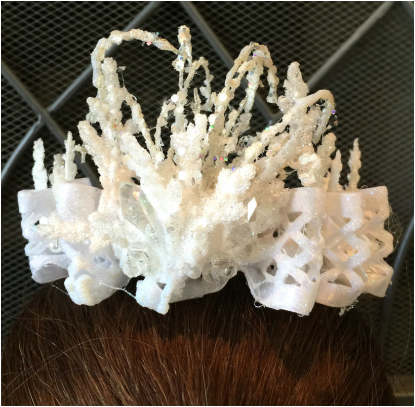 The photo is of a glittered headpiece for an upcoming ballet performance of the Nutcracker. It will be worn by snow. I'm very excited to begin my sparkle line. 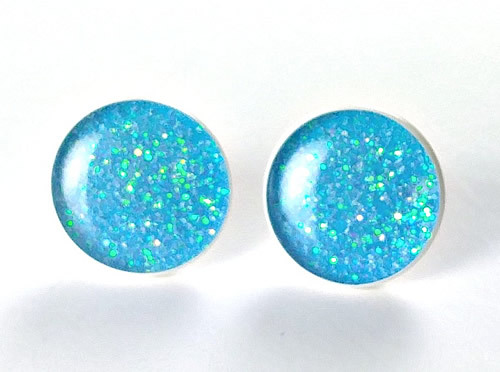 I've made a few stud earrings using glitter, but I really want to create an entire section for it. 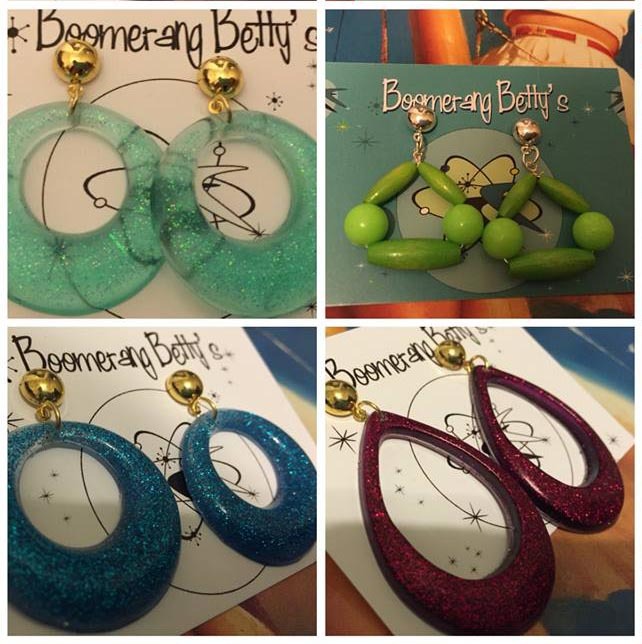 Visit her Etsy store for more glittering items! As a face painter and body artist I am always trying to come up with new wow type things. Using a body glue and neon and holographic glitters I have been playing around with designs. This is one that I just tried out. I have always loved glitter and recently have started trying to glitter anything and everything! I specialize in restoring ppl & things which other people see as lifeless or unuseful. I live by the One man's trash is another man's treasure rule. I found that glitter brought a whole new life to my Heavenly Hands Creations business. My business motto is "All I need is Jesus & Glitter " because the Lord & glitter has brought my creations and business to a whole new arena. I love glitter, the way it feels and most of all it's sparkle on my creations and the ppl that I restored. I love taking things that are plain boring and dull and making it pop with glitter! I am working on opening my own etsy store. I think everything should be covered in GLITTER!!! Life is crazy and I think we all need some sparkle. 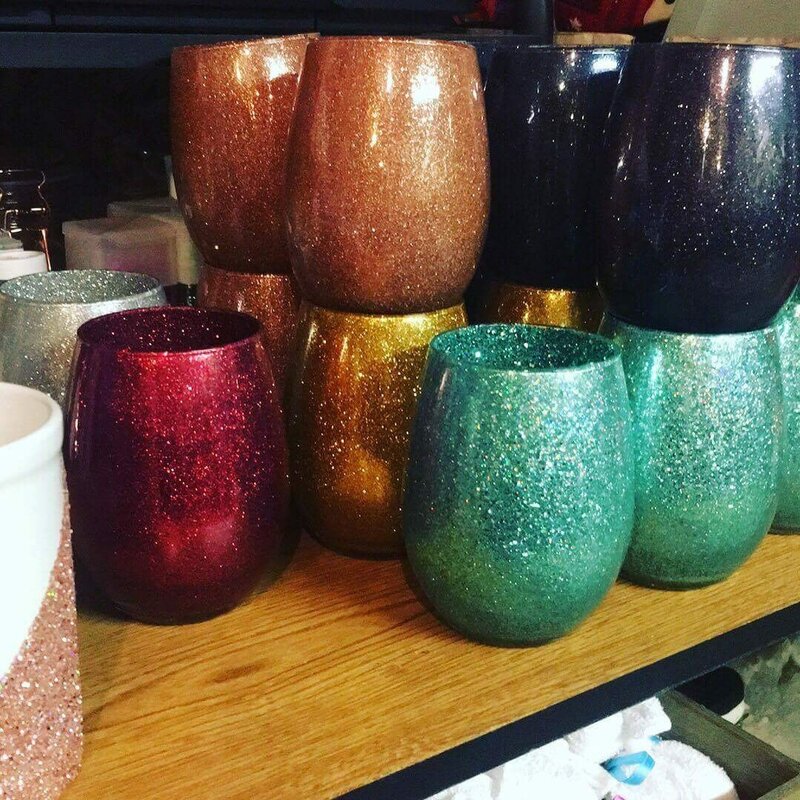 I will be covering wine glasses, coffee mugs, tumblers, and pretty much anything that doesn't move too fast with glitter!! 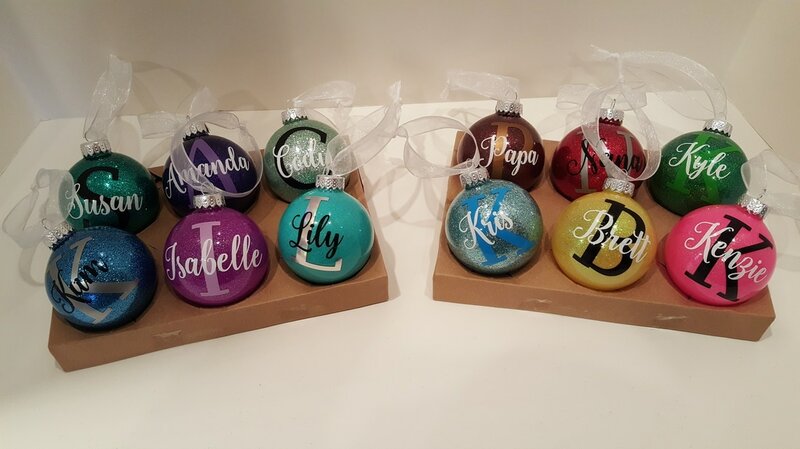 I love making Christmas ornaments with your glitter. I used some of yours to create this iridescent snow. 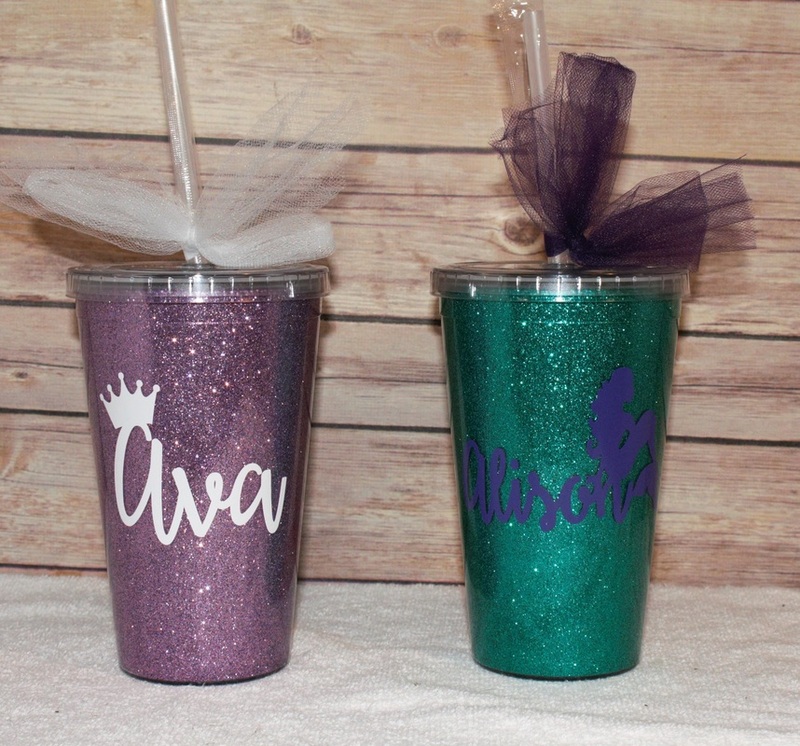 We are happy to post your glitter related items on this page. Please take a moment to write about what you are sharing and feel free to offer a link or URL to your site (even if you sell glitter too). No need to worry what brand of glitter you use. This page is set up to share with glitter enthusiasts!